Published May 2, 2017 at 482 × 600 in New Church Art Dedicated!. 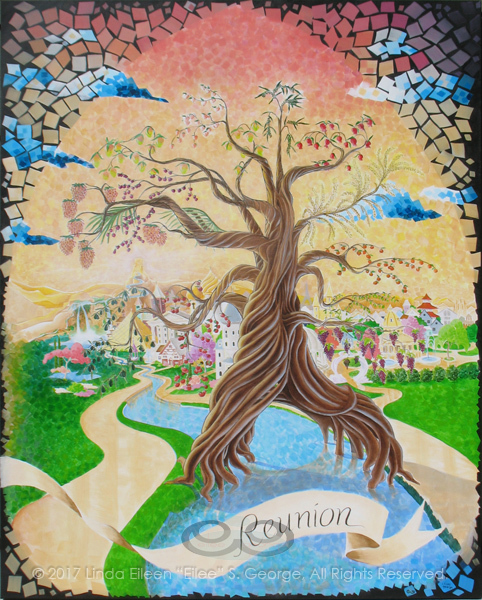 Digital photo of acrylic painting entitled “Reunion: The Tree of Life” © 2017 (Linda) “Eilee” S. George, 48″w x 60″h, part of the “3 Trees” Triptych within the Israel Series for Calvary Community Baptist Church in Northglenn, CO; lovingly painted with squarish strokes in a Neo-Pixelist style in colors including ochre, cream, mauve, plum, red, salmon, yellow, purple, blue, olive, charcoal, black, green, lime, violet, pink, periwinkle, sepia, gold, brown and white, depicting the Tree of Life in the New Jerusalem as it descends, a tree that grows on either side of the River of Life with 12 crops and leaves for the healing of nations which are represented by many styles of world architecture in the great City and lit by the throne from which the River emits as described in Revelation; signed L. Eilee George with logo – Eilee George of eileegeorge.com exhibits unique concepts and images of her own creation – this is a copyrighted image (and painting/detail) © 2017 L. Eilee S. George, All Rights Reserved. Not to be used in whole or in part or any derivative thereof, without strict written permission by L. Eilee S. George.